Contrary to popular myth, climate change won't create a barren planet. Instead, it's likely to encourage the growth of certain plants — especially invasive species. 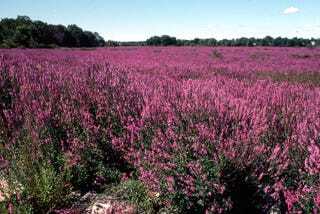 University of British Columbia evolutionary ecologist Rob Colautti studied a typical invasive species called purple loosestrife (pictured above) to see how it had evolved to deal with changes in temperature in regions where it had been recently introduced. He and his colleagues found that the plants had quickly adapted to the new climates, changing their time of flowering to maximize reproductive potential. Essentially, it only took this invasive species fifty years to evolve a new flowering time to suit the region's temperatures. We found that the evolution of local adaptation to climate in purple loosestrife increased reproduction as much as or more than escaping natural enemies. Understanding that species can evolve rapidly to local climates is important for predicting how invasive species spread and how native and non-native species alike will respond to climate change. As temperatures change across the globe, we can expect that these kinds of species will take over more regions, while non-invasive species will die out.